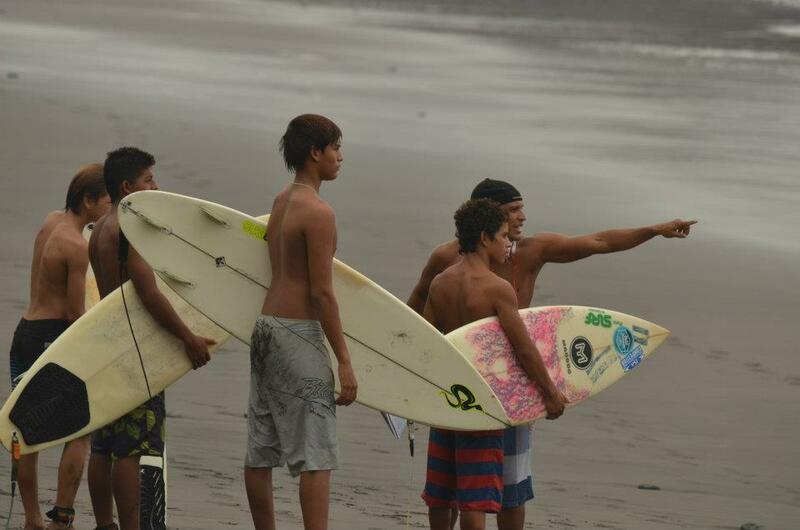 el salvador surf camps school:. ​The surf school wants to teach the students that the sport of surfing is a life experience and a personal relationship with the environment. The number one rule is to learn to respect nature and the ocean. The essence of the sport has a spiritual side, and also social consciousness. There is a need to emphasize this concept so this sport becomes a tool for the development of the beach communities in El Salvador. The surf school is dynamic and it offer programs for children, teenagers and adults, as well as personal and/or group lessons for beginners, intermediate and advance level of surfers. It is difficult to tell from the first impression how long it will take for a student to be able ride the waves. But, it's guaranteed that the student will be able to get up on a surfboard after one or two days. The progress of each student always depend on the number of hours it takes for practicing, as well as its natural abilities. But, anyone, no matter its healthy or physical condition can learn how to ride a wave, and everyday of practicing will increase its athletic skills, and it will become stronger with each surf session. - General information on the use and maintenance of the surf equipment. General and theoretical information about the ocean and its tide. - Information about the surf equipment, its name, the way to take care of it, and teaching of the surf equipment preparation before each surf session, as well as special features. - Technical exercises and practice outside the water. - The student have the opportunity to practice the theory taught, to use the surf equipment, plus tips and secrets from the certified surf instructor on how to start in the sport in a safe and efficient way. - To increase the physical performance, a series of warming up exercises based on yoga, pilates and body balance are practiced before each surf session. - Practice of the theory learned in the swimming pool helps to prevent situations and surprises inside the ocean. Series of technical exercises are performed in the swimming pool before the student goes into the ocean. - The certified surf instructor practices popping up with the student inside the ocean, taking small waves and white water. - Theoretical information on where and why a wave breaks offshore the ocean. - The surf program draws on the students' determination and ability to get to know its qualities inside the water while trying to catch waves. - Practical exercises with the certified surf instructor to try to go on more challenging waves. - The student has the opportunity to try what it has learned and catch its own waves. - Theoretical information about the type of surf equipment used for determinate conditions inside the ocean. Theoretical information on the various types and characteristics of the different surfboards, the purpose of it is so the student can later choose the right surfboard for determinate surf condition. - Practical theory on how to work together with surfboard inside the water. What has been taught inside the swimming pool and outside in the ocean combines in the practice of the sport when the student learns how to behave in different situations, from duck diving to the use of its body balance while standing up in a board and riding a wave. - Together with the certified surf instructor, the student will have the opportunity to catch waves and ride them safely and correctly. - Coaching to improve technical skills. With the experience gained through the other phases, the certified surf instructor will monitor the students and will contribute to the technical improvement and development of its skills. The instructor will give tips and secrets to give the student more confidence inside the water. Time to surf! 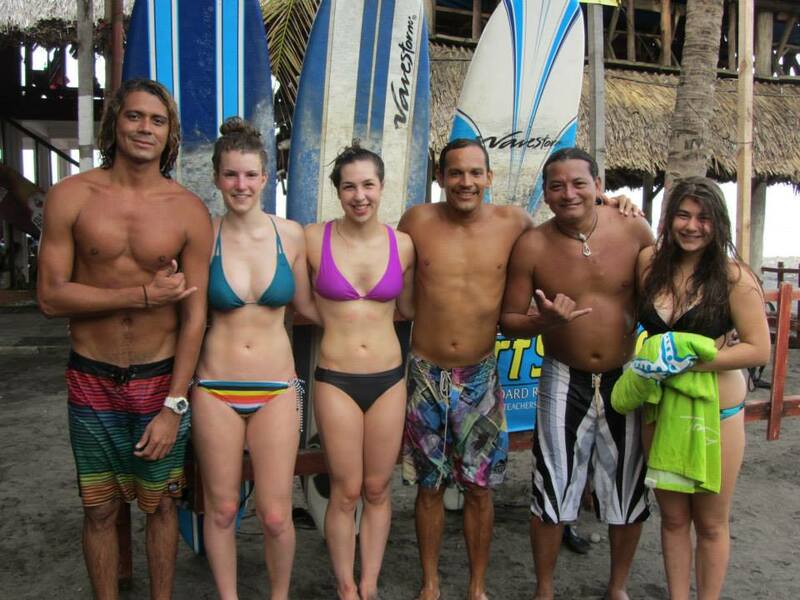 For more information visit: El Salvador Surf Camps website, or Contact Us. "El Avion" has more than 20 years of experience in surfing, he has been living in El Tunco for more than half that time and has experienced the development of the surf tourism in the country because he has been working in the industry for many years, first as a tour guide and then as a certified surf instructor. His experience includes co founding the Federation de Surf de El Salvador (El Salvador Surf Federation), and being a surf competition judge in both national and international events. He is also one of the few certified surf instructor by the ISA in the country. His main motivation is his son, Kevin, a prominent groom surfer, and all the young surf promises with or without talent, because in his opinion, surfing, like any other sport, will keep them away from problems and would give them the opportunity to meet other surfers, older and younger, that could help them in their lives. Besides, surfing is a way of living in the coast, a sport that gets people in touch with nature and their surrounding, making them aware of the ecological situations that needs to be solve in our ocean and world, making them think about solutions for the community as well. Beginner lessons US$40 for 2 hours class. Surf Coach for half a day $75 for 4 hours activity. The rates include full equipment, surf lesson, coaching and transportation. The school is dynamic, so lessons are taught in different beaches and surf spots depending on the day and ocean condition, and also on the surf level of the student. Theory of the sport and basic instructions are taught in the swimming pool of a private property though. The property offers packages that include accommodation in a private room and surf coaching or lessons. Packages to stay in other hostels and hotels in the network are also available.